Patagonia are never afraid to compare their wares to the competition so when we told them about this test they sent us two variants of their popular R1 range of mid-layers. The R1 range encompasses everything from trousers to gloves for men and women and are designed as base/mid-layers for sports and travel activities in the colder climates. We tested the R1 Hoody and R1 Pullover in varying weathers with and without assorted over-layers. Both tops are made from the same fabric with the differences being the hoody has and you may have guessed a hood and also longer sleeves with thumb loops. The first thing that hit us with this fleece is the incredible warmth you get from such a thin garment. 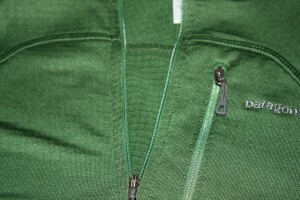 The material has been cleverly designed by Patagonia and is called a Regulator Grid Fleece. Essentially what you have is a network of tiny squares on the inside of the fleece that vary in depth which means your body heat creates a bubble of warm air around you, whilst the outside of the top however is flat and so provides excellent wind resistance. This has been coupled with a deep front zip so you can regulate your temperature when necessary and as an added bonus you don’t have to make a fool of yourself when you do take it off as the zip gives you plenty of room to maneuver. Nice touches like the ninja style hood and thumb loops (Hoody only) make this fleece incredibly comfortable as well, with plenty of stretch where you need it, and where you don’t need it a different material has been used to prevent rucking whilst wearing a harness or climbing gear. I personally loved the snugness of having the extended sleeves with thumb loop which helped to keep your hands warm and also stopped the fleece from moving around during vigorous use. Just please check the sizes carefully as these are a slim fit item and so would not be flattering if not the correct size. The styling of these is also worth a mention, as despite the focus on outdoor activities they are surprisingly good looking and look much better on than they do in the pictures which is not always the case. Our Hoody came in black and this is definitely the color I would go for as it gives the top quite a classy look, you can though if you prefer also get them in “Lemon-Lime” and “Mango”. I fell in love with this fleece from the moment I put it on, the warmth, comfort and style are a great combination which goes to explain why these tops are so popular and well regarded especially in the snowboarding/skiing scene. From a travel point of view there is plenty here to tick many boxes, they can be worn as a base/mid or out-layer. The fabric feels fleecy warm but provides excellent wind resistance and to top it all due to the thin design of the fabric this item takes up almost no pack space. 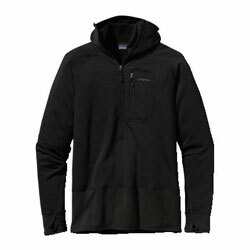 Only complaint is a lack of pockets but this is a compromise I am happy to pay as if there were more the perfomance of the fleece could be affected with the extra zips, material etc. In summary, this is a great product which is designed and performs well, I would recommend buying the Hoody version as the hood does make a big difference to warmth when it gets really chilly. Definitely one for the Ultimate Travel Packing List! Just looking at all of these fleeces are making me cold. Just traveled from the hot Caribbean to the cold highlands of Mexico and all I’m provisioned with is simple cotton clothes.